Just starting week Six. What can we expect of these pups? Any Future Show Dogs in the bunch? tried to get at reflection in the stove. outgoing, tail up. Pounced at me with camera trotted around sniffing, exploring. took a while to get tail up then very bold. ran to me, even when I was trying to hide. very outgoing barked at me, laid down under the edge of the cabinets. Watched Sally, and respected her space. Tonight was sort of mild, in the 50 degree range. The pups went outside to eat. They experienced grass and the great outdoors. this is a period of rapid mental growth. The pups need to experience as many things as possible. 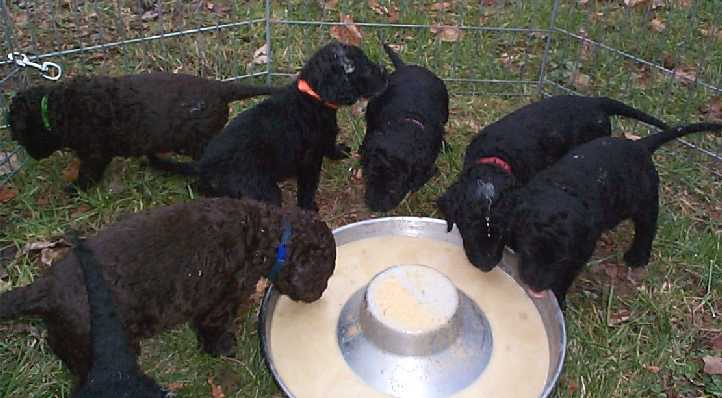 Combining eating with a new experience usually makes it positive for the pups. Puppies and play go hand in hand. Running, wrestling, tumbling and chasing, puppies love to play. But play is so much more than a fun-filled passage of time or exertion of energy. Play is essential to ensure proper mental, physical and sensory development. Puppies need an enriched environment that will foster both mental and physical stimulation through play with toys, people and other dogs. 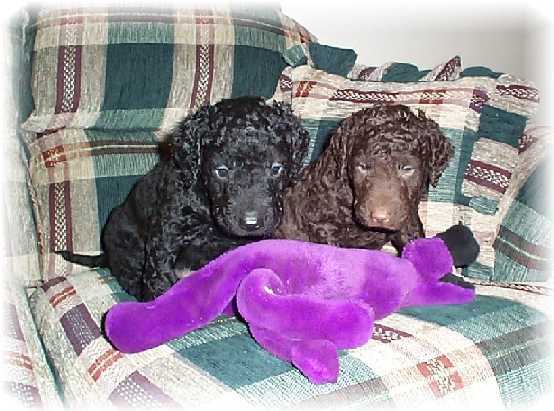 Puppies should be given toys that are both stimulating and interactive. Toys like Kongs and The Buster Cube encourage problem solving in order to gain bits of food hidden within. Other toys like Nylabones, Booda Bones, cow hooves and natural bones provide an excellent outlet for chewing activities. Squeak toys and fleece toys add additional sensory stimulation through sound and touch. If you puppy isn't given toys he can chew on when he is teething, he will find something of yours to chew on! If, and only if, you catch your puppy chewing on something he shouldn't, interrupt the behavior with a loud noise, then offer him an acceptable chew toy instead and praise him lavishly when he takes the toy in his mouth. 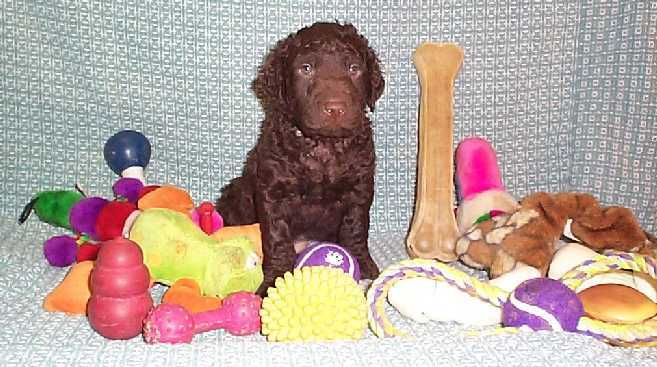 Toys should be readily available to puppies at all times, providing them with appropriate stimulation and play. 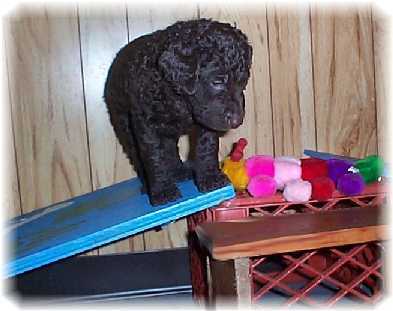 By rotating the toys available to a puppy at a given time, they remain interesting and fun. Praising puppies when they are playing with their toys lets them know that we are pleased and that this is an appropriate activity. Toys are a great way to occupy puppies when we can not. But for puppies, playing games with their human friends is "where it's at". Games like fetch, keepaway, hide and seek, tug or come-tag not only foster bonding but are stimulating and educational as well. Puppies' owners are often afraid to play such games for fear of teaching over-excitability or other bad habits. The games themselves do NOT teach puppies to be uncontrollable, ill mannered or aggressive. The lack of established rules and guidance does. 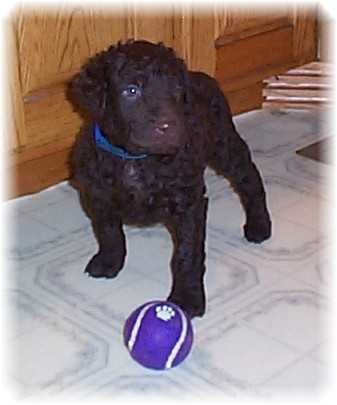 Just like our games, puppy play must have guidelines and structure that is absolute. Lack of structure and guidelines or inconsistency will contribute to confusion and frustration. This in turn will contribute to misbehavior. By saying "Let's play" just prior to initiating games and stating "Enough" just as we end a session or take a break, we can help our puppies to understand that they must wait until we initiate play and must also honor that we end it. Also, by stating "Enough" and ending play momentarily when puppies bite or jump or become too boisterous, we can clearly relay that these behaviors are inappropriate in play. There is no “right” or “best” dog toy. 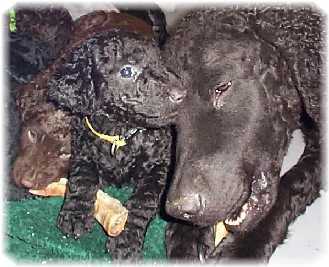 They all fulfill a part of a puppy’s (or dog’s) development. Toys should be appropriate for your dog’s current size. Balls and other toys that are too small can easily be swallowed or become lodged in your dog’s mouth or throat. 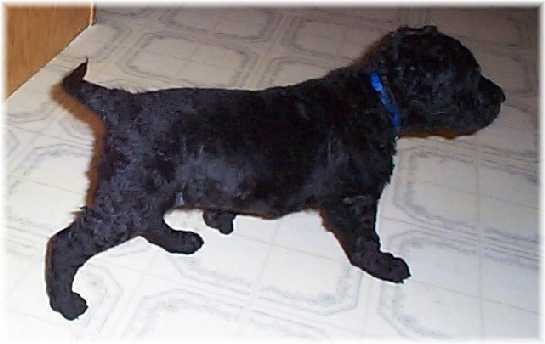 The ball that your puppy had when he was small may choke an older dog. Some dogs inhale rawhide chews, and may get an intestinal obstruction. Watch how your dog plays with toys, and how he chews on rawhide. "chewies" like hooves, pig’s ears and rawhides, should be supervision-only goodies. Take note of any toy that contains a "squeaker" buried in its center. Your dog may feel that he must find and destroy the squeak-source and could ingest it, in which case squeaking objects should be "supervision only" toys. "Rope" toys that are usually available in a "bone" shape with knotted ends. Kong-type toys, especially when filled with broken-up treats or, even better, a mixture of broken-up treats and peanut butter. The right size Kong can keep a puppy or dog busy for hours. Only by chewing diligently can your dog access the treats, and then only in small bits - very rewarding! Double-check with your veterinarian about whether or not you should give peanut butter to your dog. "Busy-box" toys are large rubber cubes with hiding places for treats. Only by moving the cube around with his nose, mouth and paws, can your dog access the goodies. Soft stuffed toys are good for several purposes, but aren’t appropriate for all dogs. For some dogs, the stuffed toy should be small enough to carry around. 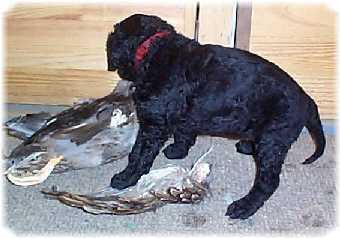 For dogs that want to shake or "kill" the toy, it should be the size that "prey" would be for that size dog (mouse-size, rabbit-size or duck-size). 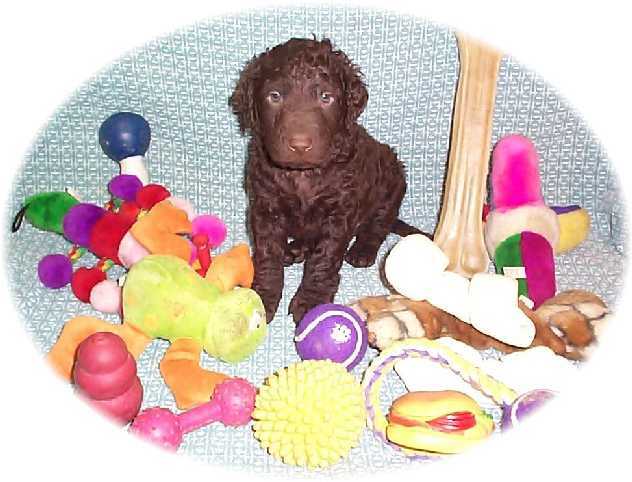 Rotate your dog’s toys weekly by making only four or five toys available at a time. Keep a variety of types easily accessible. If your dog has a huge favorite, like a soft "baby," you should probably leave it out all the time, or risk the wrath of your dog! Provide toys that offer a variety of uses - at least one toy to carry, one to "kill", one to roll and one to "baby." "Hide and Seek" is a fun game for dogs to play. "Found" toys are often much more attractive than a toy which is blatantly introduced. Making an interactive game out of finding toys or treats is a good "rainy-day" activity for your dog, using up energy without the need for a lot of space. Many of your dog’s toys should be interactive. Interactive play is very important for your dog because he needs active "people time." By focusing on a specific task, like repeatedly returning a ball, Kong or Frisbee, or playing "hide-and-seek" with treats or toys, your dog can expel pent-up mental and physical energy in a limited amount of time and space. This greatly reduces stress due to confinement, isolation and/or boredom. For young, high-energy and untrained dogs, interactive play also offers an opportunity for socialization and helps them learn about appropriate and inappropriate behavior with people and with other animals, like jumping up or being mouthy. Today the pups ate outside again. I have them eat outside not so I have less to clean up, but more to have them eat in different locations. Yesterday the pups also ate outside. Yesterday I took an X-pen they are used to, and one of the blankets from the puppy room. The food was set up and waiting for them when I carried them out. Today, we went to the same location. I used an X-pen they had never been in. It smelled like the storage shed. No blanket. The food was not there when they arrived. To those little minds, this was a whole different situation. Once everyone was there, the food arrived. They did not go in right after they were finished eating. The pups also visited with a different person tonight before they went back to the security of the play room. Everyone asks how I get the pups to sit for these silly photo shoots! The pups play hard, then sleep. While they are sleepy, I can easily get these type of pictures. If you disturb them, they give you that why are you waking me up look! Well, thats the look you see in most of these pictures. ;-) I love taking pictures. 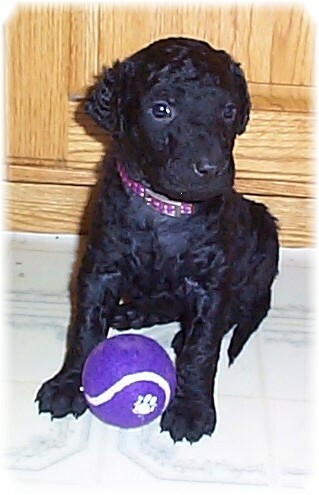 Right now you can't get any serious pictures of how the pups will look when all grown up. They change so much from day to day. So I take these pictures, and the puppies think I am a bit touched in the head. 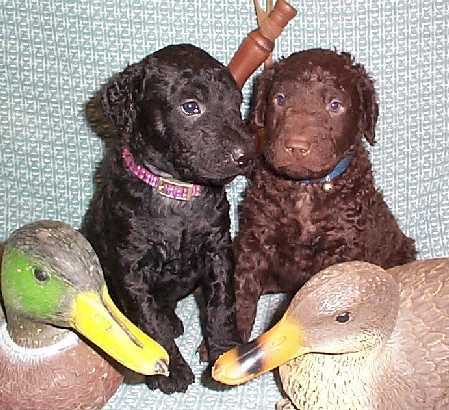 I t ook some of the pups out and put them in the shop with a duck right out of the freezer. I grabbed a few wings also. the pups seemed very interested in them. I did not tease them or move the wings. Just had them in a corner of the shop for them to explore. This morning the pups were hungry. (what a shocker!) I fed eight of them in the Shark Cage, and two in a medium shipping vari-kennel (black blue collar boy and black green collar boy). They did not mind it until they were done eating. This is the same type of cage that the pups will be shipped in for those that are flying. All the pups will be introduced to the crates. They will spend some time in the car in a crate. They will eat in a crate, and they will hopefully take a nap in the crate! At first this will be done with a buddy. Later they will be put in alone. Once these two were done eating, they wanted out! It did not take long for the two boys to quiet down and snooze. Puppies eat, then they usually nap. The crate is positioned so they can see the rest of the bunch in the Shark Cage. I ordered five more shipping crates that should be here in the next few days. 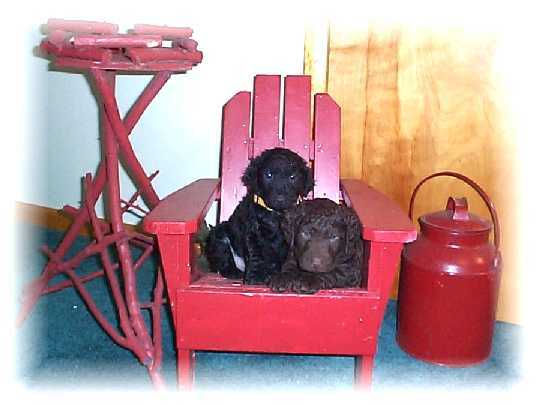 Hopefully the pups will start to think of a crate as a place they get a good meal, take a nap, and can stash some toys! After this early morning meal, this crate went into the puppy room with the door blocked open. The others are quickly found and explored this new item taking turns going in and out. A sturdy dog crate can be the best friend you and your dog will ever have. To you, a human, a crate may seem to be a "cage"--so you may object to the idea. You are not a dog. The dog regards his crate as a dog house..a security blanket to which he can retreat to rest, to escape confusion, or to adjust to strange surroundings. 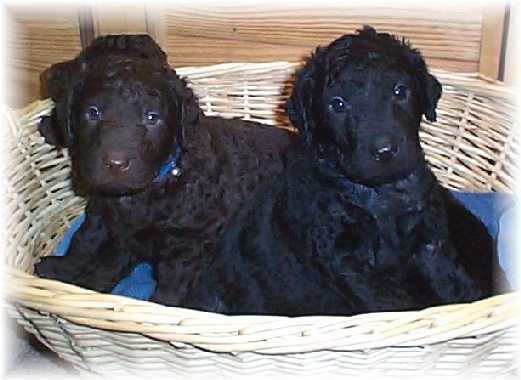 A crate is something you will want to have when you get your new curly puppy! A crate is a portable "kennel" that is just large enough to contain the dog it is intended for, made of either metal or plastic. "Crating" is the practice of using this kennel for training purposes, usually in housetraining and houseproofing a dog. Crating is a controversial topic. 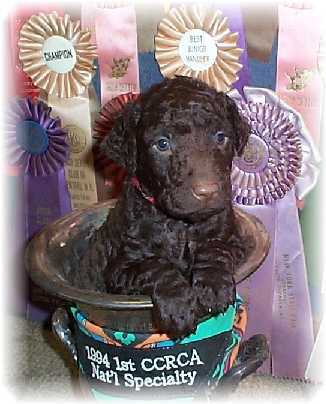 There are those who believe that crate training is indefensible and others who believe that it is a panacea. The reality is likely somewhere in between. What does the dog think? First, you must understand what the crate represents to the dog. Dogs are by nature den creatures -- and the crate, properly introduced, is its den. It is a safe haven where it does not need to worry about defending territory. It is its own private bedroom which it absolutely will not soil if it can help it. Judicious use of the crate can alleviate a number of problems, stop others from ever developing, and aid substantially in housetraining. It should be around other people. Ideally, set it up in the bedroom near you. Have the dog sleep in it at night. Dogs are social and like to be around their people. Don't force it into the crate. Feed your dog in the crate. The crate must be large enough for the dog to stand and turn around. A puppy should not be left in for more than 3 or 4 hours at a time. adult dog should not spend more than about 8 hours a day in one. No dog should be forced to remain in a soiled crate. You must rearrange time spent in the crate to avoid this happening in the first place. 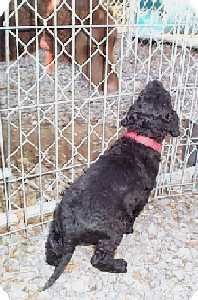 Properly introduce dogs, especially older dogs, to the crate. Most dogs like their crates, but not all do so immediately. Even when you are no longer using the crate regularly, leave it available for napping. 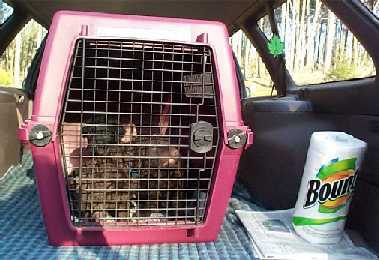 A crate trained dog is always more easily handled: in the car, at the vets, when travelling, etc. Working people should consider using an X-Pen in addition to a crate for during the day. The X-Pen can be set up in say the kitchen with the crate (with door open) in one corner of the pen. If no one will be taking puppy out during the day you will have to "paper train" in part of the X-Pen. Puppy then will have a larger area to exercise in and can still use his/her crate for taking naps. A plastic airline approved (leakproof) crate will run from $10 to $75 depending on the size. These are the cheapest prices available. If flying with a dog, most airlines will sell a crate at near-wholesale prices. Vendors at dog shows often have good prices, especially for slightly imperfect ones. Pet stores sell them at astronomical prices. Mail order stores have competitive prices (but watch out for added shipping costs), and they sell wire mesh cages. Wire mesh is comparable in price to plastic airline crates, but the sizing is different. 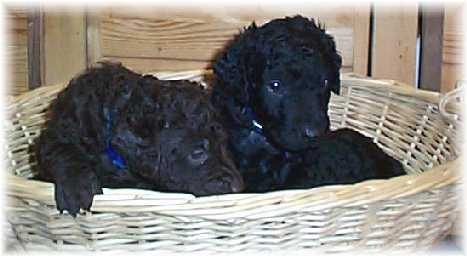 Wire cages are not as appealing to dogs that like the safe, enclosed nature of a crate, but they have better ventilation for use in warm places. You might, for example, have a plastic crate in your house and a wire one for the car. Since many models fold up, they are also often easier to transport and store. The crate should be large enough for the dog to lie down, stand up and turn around in comfortably, but not large enough for the dog to relieve itself at one end and sleep at the other. You may buy a crate sized for an adult dog and block off part of it with a chew-proof obstacle until the dog grows into it, or you may buy a succession of crates as the dog grows. 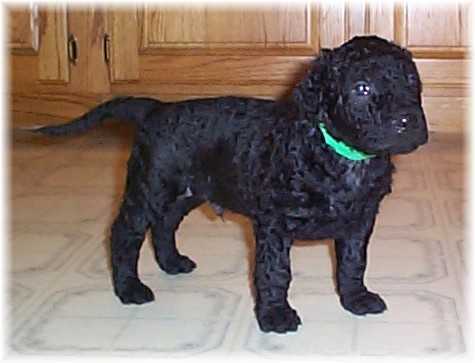 Crating a puppy or dog often seems unappealing to humans, but it is not cruel to the dog. 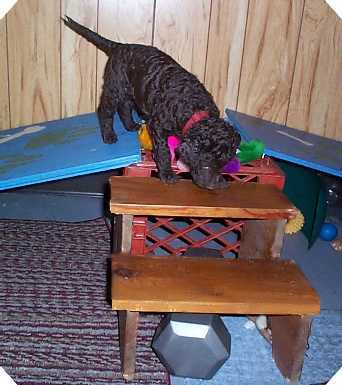 A dog's crate is similar to a child's playpen, except it has a roof (dogs can jump out of a playpen) and is chewproof. Also, a crate is not suitable for activity or exercise, but rather for rest. Dogs are carnivores and do not need to be constantly active during the daytime, like people (as gatherers) do. If a crate is properly introduced to a dog (or puppy) the dog will grow to think of the crate as its den and safe haven. Most dogs that are crated will use the open crate as a resting place. The major use of a crate is to prevent the dog from doing something wrong and not getting corrected for it. It is useless to correct a dog for something that it has already done; the dog must be "caught in the act". If the dog is out of its crate while unsupervised, it may do something wrong and not be corrected, or worse yet, corrected after the fact. If the dog is not corrected, the dog may develop the problem behavior as a habit (dogs are creatures of habit), or learn that the it can get away with the behavior when not immediately supervised. A dog that rarely gets away with anything will not learn that if nobody is around it can get away with bad behaviors. If the dog is corrected after the fact, it will not associate the correction with the behavior, and will begin to think that corrections are arbitrary, and that the owner is not to be trusted. This results in a poor relationship and a dog that does not associate corrections, which are believed arbitrary, with bad behaviors even when they are applied in time. This cannot be overemphasized: a dog's lack of trust in its owner's corrections is one of the major sources of problems between dogs and their owners. A secondary advantage of a crate is that it minimizes damage done by a dog (especially a young one) to the house, furniture, footwear etc. This reduces costs and aggravation and makes it easier for the dog and master to get along. It also protects the dog from harm by its destruction: ingestion of splinters or toy parts, shock from chewing through wires, etc. A young dog should be placed in its crate whenever it cannot be supervised. 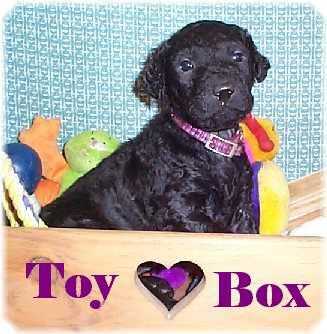 If a dog is trained in puppyhood with a crate, it will not always require crating. 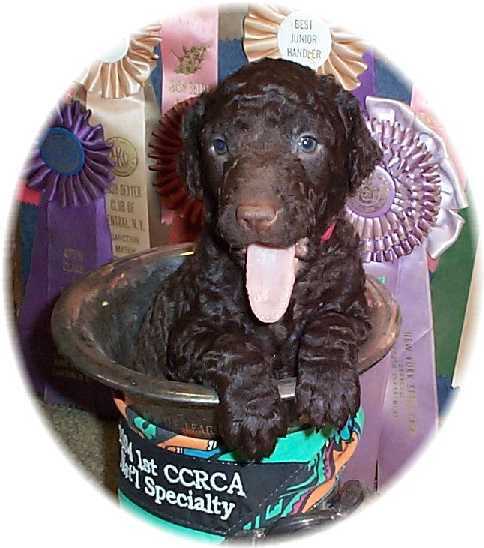 Puppies or untrained dogs require extensive crating. After a year or so of crate training, many dogs will know what to do and what not to, and will have good habits. At this time crating might only be used when the dog needs to be out of the way, or when traveling. Do let the dog out if it whines because it needs to eliminate. If you know it doesn't have to eliminate, correct it for whining or barking. Do clean out the crate regularly, especially if you've put in a floor and you have flea problems. Don't punish the dog if it soils the crate. It is miserable enough and probably had to. Don't use the crate as a punishment. Don't leave the dog in the crate for a long time after letting it eat and drink a lot (because the dog will be uncomfortable and may have to eliminate in the crate). Don't leave the dog in the crate too much. Dogs sleep and rest a lot, but not all the time. They need play time and exercise. 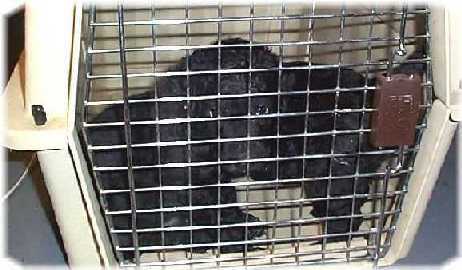 When you are at home, they should not be in the crate (except at night when they are still very young puppies). If necessary, put a leash on your pup and tie it around your waist while you're at home. Don't check to see if your dog is trustworthy in the house (unsupervised, outside of the crate) by letting the dog out of the crate for a long time. Start with very short periods and work your way up to longer periods. Don't ever let the dog grow unaccustomed to the crate. An occasional stint even for the best behaved dog will make traveling and special situations that require crating easier. Don't put pillows or blankets in the crate without a good reason. Most dogs like it cooler than their human companions and prefer to stretch out on a hard, cool surface. Besides providing a place to urinate on, some dogs will simply destroy them. A rubber mat or a piece of peg-board cut to the right size might be a good compromise (be sure to clean under any floor covering frequently). A key ingredient in crate training is to make it fun for the puppy. Do this by putting some treats in the crate and letting puppy find them. Toss the treat into the crate and when puppy goes in to get it, praise GOOD DOG....GOOD PUPPY! Once in a while when puppy goes into crate to retrieve the treat, close the door for a few minutes. If puppy is nice and quiet say GOOD PUPPY. However, if puppy is making a ruckus - IGNORE. When puppy settles down, say GOOD PUPPY and then open the crate door. Remember, your ultimate goal in using the crate is to produce an easily housetrained dog and one that can be trusted in the house. Therefore, you should consider the use of a crate for a dog to be temporary. You are always working toward the time when you do not need to use a crate extensively. With housetraining, it is only a matter of time for the pup to outgrow the need for a crate. As as puppy gets older, it will naturally develop ways of telling you that it needs to go (but probably not before about 4-6 months, be patient), especially if you encourage this. As this starts to develop, you can decrease the crate usage. 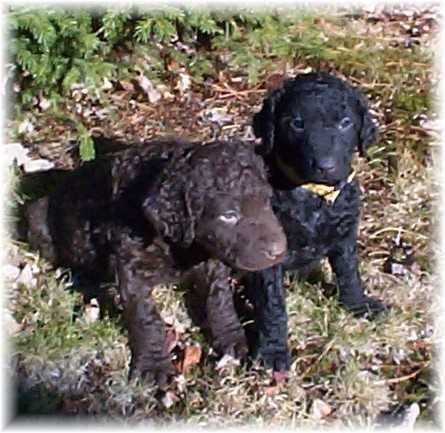 Always keep a close eye on your pup -- the trouble you take now will pay big dividends later. If you need to, put a leash on your pup and attach it to your waist. That keeps the pup from wandering off into trouble. By the time your puppy is about 6-8 months, he should be able to sleep through the night either in an open crate or a dog bed. Many breeds, especially the larger and more active ones, will need to be crated during their adolescence until they can be trusted in the home, if you cannot leave them outside in the yard while you are gone. There are several things you need to keep in mind. The first is that this type of crating is never to be a permanent arrangement except for those rare cases where the dog proves completely unreliable. While this does happen, it's more common for the dog to be sufficiently mature by the time they are two or so to be left alone in the house. To make the transition between keeping your dog in the crate and leaving him out when you are at work, start preparing your dog on weekends. Leave him in your house for an hour and then come back. Maybe it needs to be fifteen minutes. Whatever. Find the time that works, and make a habit of leaving him unsupervised in the house for that long. Be sure to praise him when you come back. (Leave the crate open -- available but open -- while you are gone.) When you know the dog is reliable for this period of time, gradually add 15-30 minute increments to the dog's "safe time." Don't be surprised if this takes months or even a year. Now, there are some dogs that are never reliable when left inside. This might include dogs that were rescued, dogs that have separation anxiety, dogs that destroy things indiscriminately, or who mark or otherwise eliminate in the house. Does everyone use a crate? Of course not. There are many who think they are cruel and will not use them. People in Europe tend not to use them. People who have not heard of using them won't generally use them. If you have an outside yard with a fence or a secure kennel you many not need to use them. They are extremely useful. But they are not the only means to achieve housetraining or safety in the house or car. They are, in the opinion of many, one of the best and easiest ways of doing so, with many side benefits. Orange girl and yellow girl ate in the crate at 8am. Green liver boy and blue liver boy ate supper in the crate. They are the only ones that tipped the dish over, made a huge mess and pitched a fit. Should be noted that the other 8 did not eat all of the meal they were given, so obviously Gabby had just been with them, and they were not hungry enough for the food to be a good distraction. The pups spent about 2 hrs outside today. Today they had 2 X-pens hooked together for a play yard. 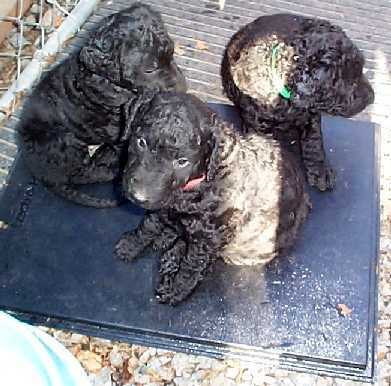 I had a Lectro Kennel Bed Heating pad out with them, so if they got cold they could snuggle on this. It's not like a human heating pad. It has an internal thermostat to keep the temperature at a dogs normal body temperature. It is for indoor or outdoor use. I removed the whelping box from the puppy room. I try to introduce a new object or a change in the puppy room each day. The pups liked the new set of of the ramps (that formerly led to the whelping box) Red collar liver girl loves playing king of the mountain. Others that seem to like to climb are Pink girl, Blue black boy, Green black boy, Blue liver boy. Others seem to like the swing. The swing is also like a den to the pups. The pups that like to go in the swing, also seem to not mind the crate as much. 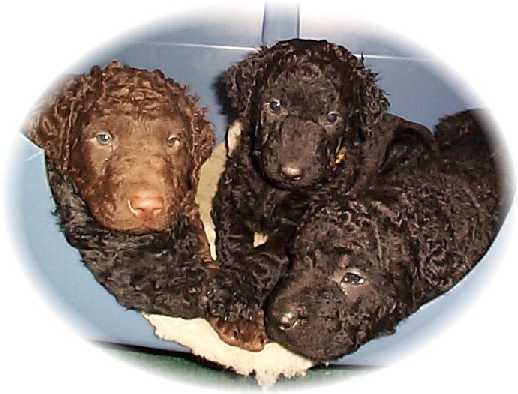 Curlies are very much a wash and wear breed. You will hear people say brush your dog... people say never brush your dog! I use an undercoat rake when the dogs are shedding, or a rubber curry brush to help loosen and pull out the dead coat. I also vacuum my dogs. If you show your curly, you will see elaborate hijinks going on in the grooming area. All sorts of voodoo coat preparations. Trimming of those hairs that are not detectable to the naked eye. 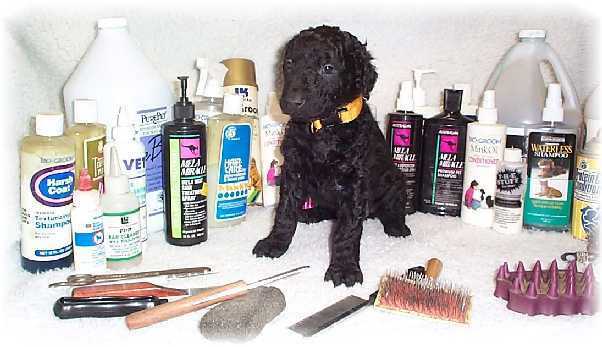 never ask a curly groomer what is in the spray bottle... they will all say water! ;-) Others just whack off whatever is sticking up and ruining the outline of the dog. (then they spray water on the coat) If your curly is a cherished pet, you don't have to do any trimming if you don't want. I recommend trimming around the ear canal, just to get better ventilation to the ears. Curlies are notorious for gunky ears, as well as eye boogers. If you want to brush your curly, go ahead. You can not ruin the coat...it will just frizz out. Just wet it down and it curls up again. The most common problems with ears are ear infections (yeast or bacterial). Most (approx.80%) ear infections are caused by allergies, even if only one ear is involved. Because of the allergic nature of most ear infections, the infection is actually a SECONDARY problem--you can treat the infection but the allergy is still there, so you need some sort of MAINTENANCE approach to most ear problems. This means, treat the immediate problem first; once that is resolved, go after the underlying cause and try to keep it from getting out of hand again. Sometimes application of an anti-inflammatory, antibacterial, anti-yeast medication 2 - 3 times a week, in between episodes of infection, can keep the infection from coming back for a much longer period of time. THESE EAR PROBLEMS ARE NEVER CURED! THEY ARE MERELY CONTROLLED.. Ear mites are actaully pretty uncommon in dogs. In any case, any of the above symptoms are grounds for having the vet check your dog's ears out. Ear mites are treated with medication. Sometimes a reapplication is needed. Some people have gotten rid of light infestations by cleaning the ear out and then coating lightly with baby oil or mineral oil. Ear infections are a little harder to treat, usually requiring daily ear drops for a week or so, weekly drops for some time after that. Some dogs prone to ear infections need to have ear drops on a regular basis. Drop-eared dogs are a bit more prone to ear infections, as prick ears normally allow more air circulation. Shake well. Put 1 small eyedropperfull in each ear. Rub it around first, and then let the dog shake. Do this once a week and you shouldn't see any ear infections. It works by raising the pH level slightly inside the ear, making it less hospitable to bacteria. To clean out an ear that's simply dirty (some buildup of dirt and wax is normal, but excessive ear wax may indicate that something else is wrong), take a cotton ball, dip in hydrogen peroxide if you like (squeeze excess out) and wipe the dog's ear out. The canal is rather deep, so you will not injure your dog so long as you only use your finger to probe the canal. Clean all around the little crevices as best as you can. Use another cotton ball for the other ear. Be sure to dry the ears out thoroughly. Most dogs need to have nails trimmed at some point. While the vet will often clip them for you, many dogs need their nails trimmed more often than that to prevent injuries and other problems associated with overgrown nails. You may find some curlies are prone to brittle nails. Nails that chip and break off if left too long. Use nail clippers available at pet stores. Look for the guillotine type (don't use the human variety, this will crush and injure your dog's nail) and get blade replacements as the sharper the blade is the easier this procedure is. There is another kind that looks like scissors with hooked tips that are also good, and may be easier to handle (however, the blades cannot be replaced on this type). Before cutting the nails, examine them carefully. If the nails are are white, the difference between the nail and the pink quick is easy to see (use good lighting). If the nails are dark, it will be much harder to tell where the quick is, in which case you must take care. If your dog resists having its nails trimmed, try trimming them while you sit on a couch with the dog on its back in your lap. By putting the dog on its back, you make the nails accessible and put the dog in a submissive position where they are less apt to fight. As with many things, this is easiest if you start while your dog is still a pup. If the cutter is sharp, the nails won't crack if you cut at right angles to the nail. that is, hold it so that the blades are on the top and bottom of the nail, not to the sides of the nail. Do not cut below the quick. It will be painful to your dog and bleed everywhere. When in doubt, trim less of the nail. It will just mean trimming more often. Clip the portion above the quick for each. Keep a styptic pencil on hand to staunch any blood flow. Flour or cornstarch will help in a pinch. You can use a wood rasp and file your dog's nails down. Also, if you clip them, using a plain file afterwards helps smooth the edges down and keep them neat. You can use "people files" or purchase files shaped for this purpose. The puppies had more visitors today. Its very important for them to get contact with different people at this age. 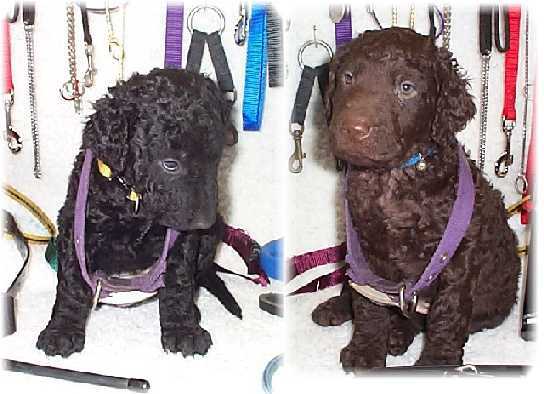 As you know, the pups have worn collars since the day they were born. Now we are changing to larger, heavier collars. 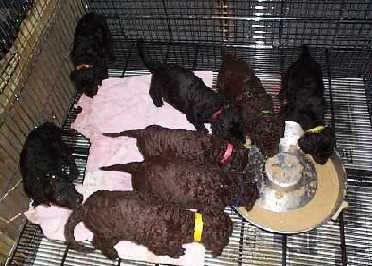 The litter collars were made of a strong paper material. I suggest you use an adjustable nylon buckle collar or one with a quick release. Puppies grow fast. You should check the collar every day for proper fit. Make sure the collar fits! The puppy collar should fit so you can get a couple of fingers under it. A puppy will often scratch at his collar. This does not mean it "itches" - it just means it feels strange and somewhat uncomfortable. Getting a puppy accustomed to being on a lead is sometimes one of the hardest and most frustrating parts of puppy training. 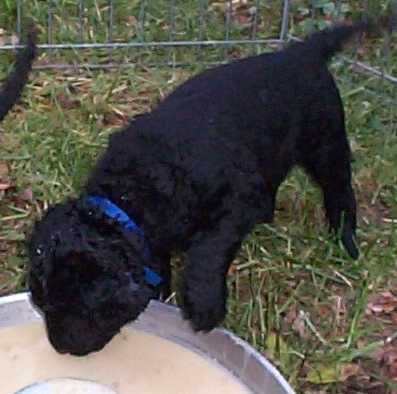 Many owners make the mistake of forcing the pup to walk while on lead, often pulling them around like a toy! Don't expect to just snap a leash on your new pup and have him walk nicely by your side. Many times the first encounter with a leash is having a stranger (new owner) tower over the pup, hook something heavy and new to his collar, and start pulling him by the neck. You will end up with a bucking puppy on the end of the leash, trying to go anywhere but with you! Take your time introducing your dog to a leash. He should always associate it with a happy experience. Use friendly enthusiasm as you place a lightweight leash and collar around your dog's neck. When he is ready, walk around the house with him without placing tension on the leash. To avoid accidents, never leave him alone with the leash attached to him. Try using treats, pat your leg, get down to his level or use a toy to lure him at first. We have a real nice day today. Going to be up in the 60's. The pups will get to spend a lot of time outside. I still hook up the Lectro Kennel Bed Heating Pad so if they get cool, they have a warm spot to cuddle in. Also the Vari-Kennel with blanket goes in the puppy yard with them, as well as various toys and one of the tunnels. A little more about the heating pad. A human heating pad is not safe for a dog or a puppy. You can not monitor or regulate the temperature close enough. I have heard of curlies who have had toes burned off when the breeder used a human heating pad. This pad is specifically designed for dogs. It can either be used in the whelping box to keep pups that aren't near mom warm, or it can be used in doghouses, kennel, garage, basement or anywhere extra warmth is desired. This is especially good for the older dogs who are starting to get a bit stiff with age. These can not overheat. They have an internal thermostat that keeps the temperature at 102° F. This may seem high in human standards, but remember, the normal temperature of a puppy is 101.5° F. - 102.8° F. The pups would be fine without it, but my goal is to make this a very positive experience for them. About noon, the pups are moved to one of the regular gravel dog runs. Gabby is in there, but she has the option of jumping over a barrier and getting away from them. Lots of new sights, sounds and smells out here. Tessa and Seger are very interested in who has moved in next door to them! (or maybe they just want to steal the toys!) They check each other out through the fence. Eventually they decide there is nothing to look at and go back to lying in the sun. Later in the day, I took the pups on a road trip. Loaded the pups in an unfamiliar crate in the back of the Subaru. I took three trips of 3 and 4 pups each. We took a quick spin down the road, onto a dirt road, to the power plant and back. Each trip took a little over 15 minutes. Then we stopped, and the pups spent an additional five minutes in the car with it off. They got to experience the noise of the car. The motion of the car. The wind through an open window, and any flashing scenery they saw. Your puppy's first experiences riding in a car will influence his or her future reactions to being taken for a car ride. Fortunately, owners can take steps to prevent or reduce their puppy's stress and fear. Keep in mind that both your mood and the attitude you project, as well as the destination of each ride, can greatly influence your puppy's experience. Handle the situation calmly and cheerfully, and choose a destination that your puppy enjoys (such as a nearby dog run or local park), so that he associates car rides with going somewhere pleasant. To help prevent vomiting, don't feed your puppy for at least a few hours prior to taking any lengthy trips. Signs of impending nausea include sudden restlessness and heavy drooling. If your puppy does vomit in the car, do not reprimand him! This would only serve to stress him more, making vomiting all the more likely next time around. Besides, vomiting is involuntary; it's something your puppy has no control over. Accidents happen! Take along a roll of paper towels, extra towel for the crate, garbage bag and newspaper. Be prepared. It won't be so bad if you are. There is nothing worse than having the pup throw up (or do something else) in the crate in the car, and you not having anything to clean up with. Last day of week six. Boy doesn't time fly! The puppies discovered some new toys in the living room -- Tessa's toys! -- with a different smell and feel to them. Today is another great day, so the pups can go outside again. You may wonder why I keep mentioning the weather. This late in November its not common to have days in the 60's! We have had snow several times already this fall, and these days are a gift. I just checked the forecast and they are calling for more snow Tuesday and Wednesday. I threw some rib bones in with the gang today. Once they discovered these treats, the little puppy growls started! Some grabbed a bone and ran under a ramp, or in a tunnel to hide and enjoy. Others out in the open shared with siblings. Gabby was out going potty at the time. Once she got back, she monopolized many of the the bones. Good lessons for the pups, who wanted at first to take them away from her, and after a few warning growls, decided not to. A puppy has to learn doggie social skills. The young pup without them that tries to take a bone away from an older dog will be in trouble! If they learn from mom at an early age to respect an older dogs space, they will be better off. Gabby at times sounds ferocious with them, but if you watch, its mostly posturing and sounds. She never hurts them. She just teaches them respect. Puppies that are taken away from mom too soon miss out on these important lessons. Raw beef knuckle bones you get from the butcher are great for the dogs. Cooked chicken bones, pork bones and ham bones will splinter, and are not recommended for your pet. For the new puppy, bones provide a wonderful means of exercise as well as an outlet due to the discomfort of teething. For the adult dog, bones also provide exercise but more importantly, bones provide a natural means by which tartar and calculus are removed from the teeth as well as providing stimulation of the gums. Canine gingivitis is a problem of epidemic proportion in our pets today and the bacteria that build up along the gum line not only leads to periodontal disease and loss of teeth but it can also spread into the circulatory system and in a dog with a weakened immune system, that bacteria spells trouble. Again, you should pick up some books on feeding raw bones before you try it. I will say that your vet may not agree with giving raw bones to your dog. Keep in mind that all Vets may not be familiar with all feeding alternatives. Supervise your pup when you do give bones. You can say something bad about just about any dog toy, bone or diversion. Many rawhide bones are processed with Lye -- something your dog does not need! Some Cows ears have been found to have the metal ear tag still in them when processed and sold! Dogs can de-squeaky a squeaky toy and choke on the pieces. 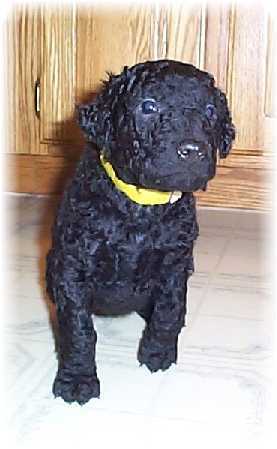 Soft stuffed toys can be de-stuffed, and your dog can ingest the stuffing resulting in a bowel obstruction. I would not say any chew toy is 100% safe. You have to watch your pet. See how they chew on things. You must teach your puppy to give up its bone on demand. This can be achieved by giving the puppy the bone, letting it take it off for a minute or so and then gently taking it away. Once the puppy has let you take the bone, give it back with lots of praise and leave him in peace to enjoy it.